How do these libraries work though? What would it take to write one ourselves? Turns out, it’s pretty straightforward and there’s an opportunity to learn some really common patterns and also learn about some useful modern APIs that are available to us. Before we dive into code, take a look at what we’re building. It’s a “done list” that adds up the things you’ve achieved today. It’ll update various elements of the UI like magic — all with no framework dependencies. That’s not the real magic though. Behind the scenes, we’ve got a little state system that’s sitting, waiting for instructions and maintaining a single source of truth in a predictable fashion. Pretty cool, right? Let’s do some admin first. I’ve put together a bit of a boilerplate so we can keep this tutorial snappy. The first thing you need to do is either clone it from GitHub, or download a ZIP archive and expand it. Next, open up the src folder and then open up the js folder that lives in there. Make a new folder called lib. Inside that, make a new file called pubsub.js. Open up pubsub.js because we’re going to make a little Pub/Sub pattern, which is short for “Publish/Subscribe.” We’re creating the functionality that allows other parts of our application to subscribe to named events. Another part of the application can then publish those events, often with some sort of relevant payload. Pub/Sub is sometimes hard to grasp, so how about an analogy? Imagine you work in a restaurant and your customers have a starter and a main course. If you’ve ever worked in a kitchen, you’ll know that when the server clears the starters, they let the chefs know which table’s starters are cleared. This is a cue to start on the main courses for that table. In a big kitchen, there are a few chefs who will probably be on different dishes. They’re all subscribed to the cue from the server that the customers have finished their starters, so they know to do their function, which is to prepare the main course. 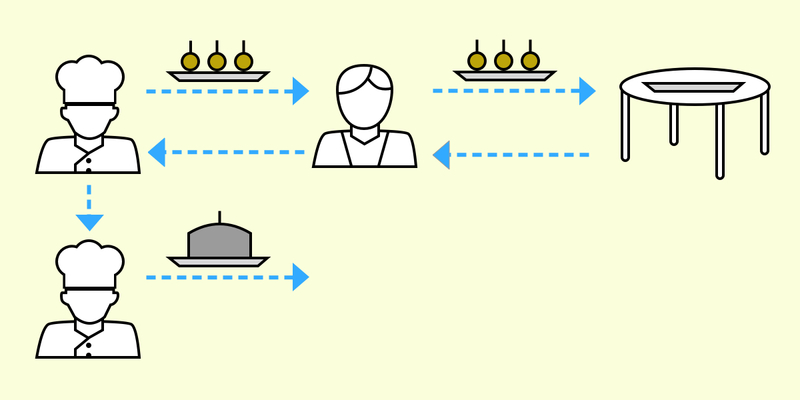 So, you’ve got multiple chefs waiting on the same cue (named event) to do different functions (callback) to each other. Hopefully thinking of it like that helps it make sense. Let’s move on! The PubSub pattern loops through all of the subscriptions and fires their callbacks with that payload. It’s a great way of creating a pretty elegant reactive flow for your app and we can do it with only a few lines of code. What we’ve got there is a fresh new class and we’re setting this.events as a blank object by default. The this.events object will hold our named events. This is our subscribe method. You pass a string event, which is the event’s unique name and a callback function. If there’s not already a matching event in our events collection, we create it with a blank array so we don’t have to type check it later. Then, we push the callback into that collection. If it already existed, this is all the method would do. We return the length of the events collection, because it might be handy for someone to know how many events exist. This method first checks to see if the passed event exists in our collection. If not, we return an empty array. No dramas. If there is an event, we loop through each stored callback and pass the data into it. If there are no callbacks (which shouldn’t ever be the case), it’s all good, because we created that event with an empty array in the subscribe method. That’s it for PubSub. Let’s move on to the next part! Now that we’ve got our Pub/Sub module, we’ve got our only dependency for the meat‘n’taters of this little application: the Store. We’ll go ahead and start fleshing that out now. Let’s first outline what this does. The Store is our central object. Each time you see @import store from '../lib/store.js, you’ll be pulling in the object that we’re going to write. It’ll contain a state object that, in turn, contains our application state, a commit method that will call our >mutations, and lastly, a dispatch function that will call our actions. Amongst this and core to the Store object, there will be a Proxy-based system that will monitor and broadcast state changes with our PubSub module. For those who work with ES6 regularly, this will be very recognizable. Running this sort of code without a bundler will probably be less recognizable though. There’s a heck of a lot of support already for this approach, too! What’s happening here is we’re trapping the state object set operations. That means that when a mutation runs something like state.name = 'Foo' , this trap catches it before it can be set and provides us an opportunity to work with the change or even reject it completely. In our context though, we’re setting the change and then logging it to the console. We’re then publishing a stateChange event with our PubSub module. Anything subscribed to that event’s callback will be called. Lastly, we’re checking the status of Store. If it’s not currently running a mutation, it probably means that the state was updated manually. We add a little warning in the console for that to give the developer a little telling off. There’s a lot going on there, but I hope you’re starting to see how this is all coming together and importantly, how we’re able to maintain state centrally, thanks to Proxy and Pub/Sub. The process here is: look for an action and, if it exists, set a status and call the action while creating a logging group that keeps all of our logs nice and neat. Anything that is logged (like a mutation or Proxy log) will be kept in the group that we define. If no action is set, it’ll log an error and bail. That was pretty straightforward, and the commit method is even more straightforward. This method is pretty similar, but let’s run through the process anyway. If the mutation can be found, we run it and get our new state from its return value. We then take that new state and merge it with our existing state to create an up-to-date version of our state. With those methods added, our Store object is pretty much complete. You could actually modular-ize this application now if you wanted because we’ve added most of the bits that we need. You could also add some tests to check that everything run as expected. But I’m not going to leave you hanging like that. Let’s make it all actually do what we set out to do and continue with our little app! To communicate with our store, we’ve got three main areas that update independently based on what’s stored in it. We’re going to make a list of submitted items, a visual count of those items, and another one that’s visually hidden with more accurate information for screen readers. These all do different things, but they would all benefit from something shared to control their local state. We’re going to make a base component class! Let’s talk through this chunk of code. First up, we’re importing the Store class. This isn’t because we want an instance of it, but more for checking one of our properties in the constructor. Speaking of which, in the constructor we’re looking to see if we’ve got a render method. If this Component class is the parent of another class, then that will have likely set its own method for render. If there is no method set, we create an empty method that will prevent things from breaking. After this, we do the check against the Store class like I mentioned above. We do this to make sure that the store prop is a Store class instance so we can confidently use its methods and properties. Speaking of which, we’re subscribing to the global stateChange event so our object can react. This is calling the render function each time the state changes. That’s all we need to write for that class. It’ll be used as a parent class that other components classes will extend. Let’s crack on with those! Like I said earlier, we’ve got three components to make and their all going to extend the base Component class. Let’s start off with the biggest one: the list of items! I hope that code is pretty self-explanatory after what we’ve learned earlier in this tutorial, but let’s skim through it anyway. We start off by passing our Store instance up to the Component parent class that we are extending. This is the Component class that we’ve just written. After that, we declare our render method that gets called each time the stateChange Pub/Sub event happens. In this render method we put out either a list of items, or a little notice if there are no items. You’ll also notice that each button has an event attached to it and they dispatch and action within our store. This action doesn’t exist yet, but we’ll get to it soon. Next up, create two more files. These are two new components, but they’re tiny — so we’re just going to paste some code in them and move on. Again, we’ve covered everything in there, but you can see how handy it is having a base Component to work with, right? That’s one of the many benefits of Object-orientated Programming, which is what most of this tutorial is based on. Now that we’ve got our front-end components and our main Store, all we’ve got to do is wire it all up. Like the actions, these mutations are minimal. In my opinion, your mutations should always be simple because they have one job: mutate the store’s state. As a result, these examples are as complex as they should ever be. Any proper logic should happen in your actions. As you can see for this system, we return the new version of the state so that the Store`'s <code>commit method can do its magic and update everything. With that, the main elements of the store system are in place. Let’s glue them together with an index file. All this file is doing is importing all of our store pieces and glueing them all together as one succinct Store instance. Job done! What we’re doing here is adding an event listener to the form and preventing it from submitting. We then grab the value of the textbox and trim any whitespace off it. We do this because we want to check if there’s actually any content to pass to the store next. Finally, if there’s content, we dispatch our addItem action with that content and let our shiny new store deal with it for us. All we’re doing here is creating new instances of our components and calling each of their render methods so that we get our initial state on the page. With that final addition, we are done! Open up your browser, refresh and bask in the glory of your new state managed app. Go ahead and add something like “Finished this awesome tutorial” in there. Pretty neat, huh? If you want a finished version of this little system, check out this GitHub repository. You can also see a demo here. If you develop on this further, I’d love to see it, so hit me up on Twitter or post in the comments below if you do!